Do you just love what you’re doing? We know the numbers and sometimes we just shake our heads and wonder, ‘how do they do it’? For ten days from 30 November until 10 December Threshers will be running a 40% off sale at their stores. The sale won’t be advertised and they are not promoting it at all, even in the store. 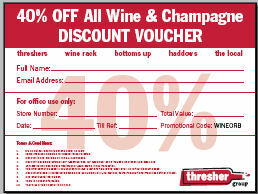 That means 40% off Stormhoek and all of the other wines and Champagne in the store. You’ll need a coupon. Download it here [PDF file]. Microsoft's Steve Clayton interviewed me a week or so ago. Not my worst interview ever, by any means. About 7 minutes long. Enjoy. Wouldn’t you love to be paid to eat chocolate? Or to lie on your back and watch the waves roll in? I’m sure there’s a way to do it. Some people get paid to drink wine. And to say anything they want to about it. Take Ollie Smith. He gets to eat and drink as much as he likes and gets paid to talk about it on half a down regular British TV programmes. And just in case you might miss the TV when you’re driving, he also talks about what he’s eating and drinking on British radio. We have singing and dancing Idols on TV. Ollie is the UK’s first wine drinking and talking Idol. He beat all of the other would-be Idols last year on BBC TV. Then there’s Kate Ennis and Natasha Hughes. They love traveling everywhere and anywhere, eating and drinking only the best. Last week, Kate, Natasha and Ollie were being driven all around the Western Cape by Thelma, who’s pretty and nice and a good driver. The 3 Brits then could concentrate on the job. On Thursday, they went to Fairview where they were greeted by dozens of wines and even more dozens of cheeses, followed by a leisurely lunch. Then they came to Stormhoek where we went for a walk among the vines and orchards. We even met Poppie the Percheron, who posed for pictures. Then we had to start working and I opened about a dozen bottles. I didn’t ask them why they are called the Lifestyle Group. But you might think it is obvious. I’m not sure if we started something, but we posted that despite the fact that we won a Trophy, we were a bit uneasy with the whole thing: The cost of entry, the awards ceremony, etc. The articles I think, were filled with inaccuracies and hyperbole and unfairly critical of all wine awards. More importantly, they really missed the point: From where we sit, over the coming years, online information will marginalize the need for many awards anyway. Historically, authority in the wine business has been very “top down”. The few bestow authority on the many. Whether we are talking about awards, Wine Spectator ratings or newspaper columns, a relatively small group of people control and dole out ranking and authority to the hundreds of thousands of producers around the world. If you speak to a producer about their wine, it often starts with “we won this medal or that award or got xyz rating in The Spectator”. Ratings are valuable because they simplify communication with the consumer. They deconstruct complicated messages about appellation, production techniques that the trade think the consumer cares about, but generally don’t. But the problem remains: Relatively few people control the topics and quality of the discussion. We talk about the fact that the “ New” web (web 2.0) has changed the world. Web 2.0 gives everyone a voice: Every consumer, every member of the wine trade and every producer. We believe that this will ultimately more evenly distribute control from the hands of the few journos, publications and awards businesses to the control of the consumer. After all, logically, what should matter more? The opinions of a few tasters at an awards contest or the consensus of hundreds or thousands of consumers? If a consumer wants to know about a book, one can get lots of reviews just by going to Amazon or doing a google search. You can still read book reviews in the Sunday New York Times, and this is a valuable resource to the reader, but there is wisdom in the collective opinion of the masses and we will start to see this with wine. Ultimately, what makes the perception of a wine over time will not be about the opinions of a few, but the collective opinions of thousands of drinkers around the world. It's a pretty big deal in US marketing circles etc. Interesting. It seems a certain Hugh MacLeod, and this small African winery called Stormhoek, made the list [see page 12]. I dunno. Something to with do with blogging or whatever. A wee 10-minute video interview I did with Microsoft's Steve Clayton, back at the recent London Girl Geek Dinner. Some of the stuff we covered you might have read on gapingvoid already. Steve and I seem to be having this long, ongoing conversation at the moment ["Think of it as a Work In Progress, Dah-ling! "], which I for one am really enjoying. Hope he feels the same. [Bonus Link:] A nice written exchange I had recently with Steve Ball, the chap at Microsoft who, along with Guitar Legend, Robert Fripp, created all the music and sounds for Microsofts' new Windows Vista operating system. As someone who has worked in television for almost 15 years, Jamie Goode's post River Cottage Goes Lame, which is basically about how Channel 4's 'The River Cottage Treatment' sucked, isn't surprising in the least. In the mid-90s, there seemed to be a massive influx of people to the British TV industry who seemed only really excited about meeting a 'sleb' rather than making good programmes. Ten years down the road and many of those people are now Commissioning Editors... the same people who decide what fills the schedules. Producers of programmes aren't necessarily experts in the subject they are producing - for example, producers of Science and Factual programmes are more often than not Arts graduates. The level of information on a topic tends to only go as deep as the producer's. They probably went to film school assuming they were going to be the next Scorsese... and here they are producing a half-hour on friggin food. So, they bash that one out, cash their pay check and hope that Hollywood phones damned soon so they don't have to accept that job on 'Saturday Cooks!' for Prospect Pictures. Jamie Goode and his readers used words like "manipulative", "facile", "banal" and "utterly useless" in order to describe television. And I don't disagree. With some exceptions, obviously, a huge number of people working in television are manipulative, facile, banal and utterly useless. And these are the people who are guiding on-screen talent like 'The River Cottage Treatment's' Hugh Fearnley-Whittingstall. I've had a producer ask me to try and make a guest cry. I've had a producer tell me 'oh it's just tv, lie'. I was once pitching a documentary idea to an executive producer about Albert Einstein's first wife Mileva Maric, including her possible contributions to his Theories of Relativity, their illegitimate daughter who was given up for adoption and died young, how Mileva died penniless and is buried in an unmarked grave... this exec said, "This would be perfect for Jerry Hall to present!!" When people go into an industry for the "wrong" reasons - ie the perceived glamour or the pursuit of fame over talent- rather than for a noble reason like "passion", then you are going to get an industry that reflects that. If the industry continues to accept and encourage the "wrong" reasons (whilst at the same time keeping the doors barred to those who are passionate), there will be a tipping point where there is no turning back and it is stuck in its faded glory. That's where television is right now- all of the passionate people are jumping ship. Face the facts, television is dead. What's the state of the wine industry? "So, Hugh, why are you so interested in Microsoft?" "Rebirth" is a wonderful metaphor, meaning everything from "re-invention" to "regeneration" to "renaissance" to... just about anything. I find that a large part of the human experience is [a] getting oneself into a rut and then [b] figuring out how to get oneself out of it. What is true for individuals is also true for large groups of people... businesses, organizations, nations etc etc. How do we re-invent our modus operandi? Serious question. I don't claim to have all the answers, but it's a subject that interests me professionally more and more. And I think it's a subject that also interests Microsoft more and more. How do they grow? How do they avoid extinction? How do they keep innovating, instead of being calcified to death by their own corporate inertia, something that all big companies suffer from [and often succumb to]? i.e. It's a subject that genuinely interests us both. And where there's genuine mutual interest, there is connection. 2. Robert Scoble. I once went on record saying that Robert Scoble, blogging as a Microsoft employee [N.B. he quit Microsoft earlier this year], was the biggest thing to happen to advertising since Apple's "1984" commercial. I took me a while to figure it out, but one day I suddenly realized, the big story about Robert blogging from inside Microsoft wasn't the effect he was having on outsiders like myself ["Oh, what a lovely blog, I think I'll go out and buy me a new PC"], but on the effect he was having on his fellow Microsoft employees. His blog was starting conversations that simply could not have happened before the invention of the blog. Why? The Porous Membrane, of course. This one little insight completely changed and informed my views about the future of marketing. So I have Microsoft to thank for that one. 3. Microsoft is an interesting company. If they weren't, I doubt they'd get so many millions of words in the mainstream media written about them, every year, like they do. All I'm doing is the same as countless thousands of other journalists and bloggers are doing. 4. Being nice pays off. Thanks to becoming friends with Scoble and the London Girl Geeks in the last year or two, I've since met quite a few MS people, and to be quite honest, for the most part they've all been well-mannered, interesting, engaging, passionate, very smart people, and I've enjoyed their company. Unlike some of the arrogant jerks I've met from other companies in my time. 5. They're in the software business, I'm in the software business. They have a commercial interest in Microsoft product. I have an [albeit much smaller] commercial interest in Thingamy product. So we've got that in common. 6. They're in the de-commodification business, I'm in the de-commodification business. So you think $300 desktop software is ubiquitous? You should see the $10 wine business. Where 80% of the wine sold in the UK is bought by a half-dozen or so top supermarket and retail chains, and the number of commercial, large-scale wineries in the world number in the tens of thousands. You try rising above that clutter, Boyo. Yeah, not easy. Again, where there is common interest, there is connection. 7. 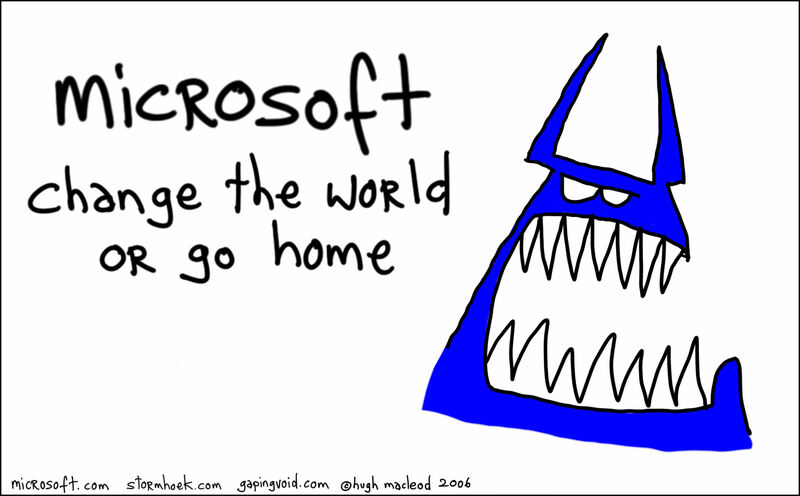 Microsoft wants to change the world, Stormhoek wants to change the world. Again, common interest. How well we succeed is always debatable, but hey, you only live once. Despite my slightly bitchy post about our best-pinotage-in-the-world-trophy from the IWSC, we were in fact, honored to have received it, even if has an ad for a competitor baked into it. While the guys were receiving the trophy last Wednesday night in London, over in Boston, Mass., our buddy, Dave Parmet, was attending a much different kind of gala on our behalf: The annual Society of New Communications Research Ball. SNCR is a non-profit think tank dedicated to the advanced study of new communications tools, technologies and emerging modes of communication, and their effect on traditional media and communications. According to SNCR, the awards were in recognition of innovative organizations and professionals who are pioneering the use of social media (i.e., blogs, wikis, podcasts, collaborative tools and other forms of participatory communications) in the areas of marketing, public relations and advertising, politics, entertainment, academics, and community and cultural development. We received an Award of Excellence for our use of this blog and social software over the last year. The folks at SNCR posted a nice précis on our UK work. It was just about a year ago when Hugh did a post which resulted in our new Siren offering, wherein he asked: “Why can't a small wine company think of there competition as Apple and Google?" Despite the fact that Robert Scoble at Microsoft agreed, some people scoffed at the idea. These days, much of our inspiration comes from the world of tech, fashion and pop culture, not wine. We find that this makes for better quality wine, and not the usual inspirational channels that winemakers adhere slavishly to. [Bonus Link:] Great interview of Dave by Shel Israel. I was talking to my husband about out favourite 'drinking' films. Though we named 'Sideways', 'Casablanca', the James Bond movies' 'Arthur', 'Animal House' and 'The Jerk', our favourite drinking movie of all time has got to be 'Withnail & I'. 'Withnail & I' is considered one of the top British films ever made and was voted the third funniest film of all time by readers of 'Total Film Magazine'. One things for certain 9 out of 10 Brits under the age of about 40 will have quoted the film at least once in their life, more often than not it being "I demand to have some booze!" Very briefly, the film follows the exploits of two 'resting' actors, Withnail (Richard E. Grant) 'and I' (Paul McGann) in 1969 Camden Town in London. They drink away their disappointment at being unemployed and decide to go away on holiday (by mistake). That's it. But it's one of the most brilliantly written, perfectly directed and marvellously acted comedies around. Of course, I've never known a single person to finish the game (I think it's the sherry that properly gets me). As we've got older our game playing has veered from sitting on the floor in front of a small telly and a loud VHS machine trying to match Withnail drink-for-drink to basically just over-indulging on expensive wine and stinky cheese while watching it on our wall mounted wide-screen telly and home cinema surround sound system. We still believe that you've not properly watched 'Withnail & I' if you're not ill for at least two days afterwards. Take a weekend, get some great wine and food in, buy or rent the DVD, over indulge yourself. And laugh. Johnny Ray, wine writer for The Daily Telegraph, selected Stormhoek Siren Sauvignon Blanc as one of his wines of the week last Saturday. Alistair, Chris and Nick went off to the London International Wine and Spirits Awards dinner Wednesday night at Guildhall, in the City of London, to pick up our Best Pinotage Trophy. Here is a short vid of Al getting ready in the office for the dinner. Nick received the trophy and it is now sitting in my office. As you’ll see, Al was a little under whelmed with the prospect of going to the dinner and the Trophy itself. It is interesting that while Al is a bit disdainful of the Trophy, Graham has said that it was the best thing that has ever happened to us in the South African market. He has done tons of new business and our 2005 Pinotage is now a hot commodity in the local market. From my position, it's all good. However, there is one thing that I find really disturbing about the Trophy. If you take a look at the engraving on the trophy, it reads: “KWV International Trophy for Pinotage”. As far as I know, KWV had nothing to do with this Trophy. They certainly had nothing to do with the making of the wine and the judging was done by an independent panel. So, why is their name engraved across our Trophy? It appears that it is some sort of sponsorship. The organizers list all of the sponsorships are here. So, it seems that for a bit of cash, you can have the appearance of having produced some trophy winning wine, or get the implied status of having granted a competitor a trophy for their wine. Either way, it's a bit of sleight of hand that I think undermines the gravitas that the organizers try very hard to foster. The conflict is obvious. Many awards organizations are for profit businesses. They need to earn a profit. Entries for this IWSC award cost, if memory serves, about $200 per wine. Thousands of wines are submitted.Tickets for the awards dinner are nearly $300 each, around 700 people attend. You get the idea. The sponsorships must generate some cash and then if you want to put the medal on your bottle, it costs for the stickers, etc. I prefer the old California County Fair system. Respected members of their respective fields get together and judge the best bred pigs, goats, cattle, roosters; most delectable apple pies, cookies, ribs, etc. Wines include homemade wines and commercial wines. Commercial wines cost $44.00 to enter. If you have a great homemade beer, there is a judging for that, too. A gold medal from one of the California fairs carries a lot of weight. People get together, have a good time and enjoy the harvest bounty. No pretense. Just Fun. My friend went on a blind date the other night. Her first. Apparently, she had been told the guy was tall, handsome, funny, clever, musical, a doctor. He had been described to her as looking like Adam from Spooks. She'd prepared for the date all week - getting lots of rest, going to the gym, buying a new outfit (including shoes). She was incredibly excited. She did, however, say that she was sure it was going to be a massive disappointment. They met in a bar in Central London. On first meeting, she wasn't disappointed - he was indeed tall and handsome, very charming. He asked what she wanted to drink, she asked for a Leffe Blonde. He went to the bar, ordered their drinks and on his way back that's when she realised: he's gay. She said it wasn't just the too tight jeans and the leather jacket. It was the white wine. He had ordered white wine. For. Himself. I told her that surely there are loads of straight men who drink white wine. "In a bar?" she asked. I had to concede,"That is a bit poofy, but I thought gay men were drinking cocktails these days." She pointed out that this guy came out on a date with a woman, clearly by ordering white wine he was trying to hide his gayness. A Cosmopolitan would having given it away immediately. I tried to think of any man I've ever known, friend or boyfriend, straight or gay, who has ever ordered white wine in a bar. Sure, we've had white wine with dinner, but in a bar? I couldn't think of a single one. So please, tell me, do you think the fact this guy ordered white wine in a bar makes him gay? I want answers people. My friend's future depends on it. Every spring we witness the courtship dance of the South African human male, the rugby Currie Cup final. By 6pm, the game is over, the dominant males have been identified and dark begins to fall. At about the same time, around our house and in the adjacent Cabernet Sauvignon vineyard, the fireflies start their courtship show. Both males and females flash their beacons and cavort around in the dark. This happens every night, except in rain, for about 3 weeks, from about 7pm till pm when the electric lights stop flashing and the lovers can’t be seen. Their party is a spectacular affair and without the stimulation of wine or other aid, they get a whole new generation going. We await their return at the end of the next rugby season. As usual, I tried to take a picture to illustrate this post. However, the job difficulty exceeded my ability with the camera. A firefly is about 1mm long and about .3mm wide. The lamp that emits the flashes under the abdomen is perhaps .2mm square. You can see the light for 10 or 20 metres but it doesn’t make any impact on the digital receptor, especially as the firefly doesn’t stay still for you to get some time exposure. hogs at the trough. The market has been growing like mad, in all sectors. discounting, worseing margins and tough times all round. now a slightly declining category. The market is in oversupply. It happened with cars, railroads, overnight services, fast food, beer, supermarkets, newspapers, etc. And now it's wine's turn. Something interesting happens when markets mature: Competition mercilessly weeds out the weak and uncreative. It used to be, a good wine and a nice label resulted in business. All of us in the UK trade need to think hard about how we are going to make a difference in the short term. I suspect the UK wine landscape will look much different in a few years.